Altstadt Hoffman Plumbing is a family owned Evansville company servicing the tri-state area for over 30 years. We are licensed, bonded, and insured plumbers. Altstadt Hoffman’s highly trained Evansville plumbers offer a variety of fast, reliable local plumbing services for your home or business. We offer quality service and specialize in new construction, commercial, industrial, residential, remodeling, and emergency repairs. Whatever the job, you can count on us to get it done right and as efficient as possible. At Altstadt Hoffman, we believe in providing high quality service at a competitive price. Our goal is your satisfaction! To exceed our contractors and owners expectations by offering reliable, timely, and fair cost service, through continuous quality work and open communication. Do other guys offer a 100% plumbing service satisfaction guarantee? We do! At Altstadt Hoffman, we believe in providing high quality local plumbing service at a competitive price. Our goal is your satisfaction! We used Altstadt for a major bathroom remodeling project. They were outstanding to work with from start to finish. What other company would give you the owner's personal cell number to call? And every time I called he answered, or called back promptly. Andy E. did the remodeling work and the workmanship was outstanding. I can't say enough about how pleased I am with our beautiful new bathroom. Altstadt cleared out tree roots in nearly every pipe in our house's entire plumbing system when 2 other plumbers (each coming 2 times) could not. We dealt with laundry issues for over 2 years, but Altstadt showed up (horrified that we'd had to deal with it for that long!) and promised that that would be the last day we'd ever have to take an entire day to do one load of laundry. They were right! Professional, diligent, friendly, and reasonably priced. We hope to never need them again but if we do have plumbing problems in the future, we will be calling Altstadt! We have used Alstadt for several minor projects over the last few years, always with great results. Today "PJ" came to the house for a few new minor repairs. He was very professional. courteous, and did a great job. I highly recommend Alstadt for all these reasons. They are great from start (scheduling) to finish (showing up on time and completing the task at hand). Great job guys!!!!! They showed up super quick and in less then a few minutes fixed the problem. They were really friendly and professional. I would definitely recommend them to friends and family. After having called Altstadt Plumbing for some minor plumbing repairs in April of 2013 and being very pleased with their punctuality, professionalism and the quality of work, I again called them near the end of 2014 on a much bigger project involving removal of an existing tub/shower surround and replacing it with a tiled walk-in shower. Dave walked me through the process and thoroughly answered my questions from the start. Actual work was scheduled for the beginning of January, 2015. The job was done first-class and on time, exactly as planned. Andy E. oversaw the project and did the bulk of the work. I was very pleased with all the work done and the finished product which is awesome!! Even better than I envisioned! I highly recommend Altstadt Plumbing and their workers to anyone planning a bathroom remodeling. You can tell these people take pride in their work. A great bunch of guys who take care of all the details, consistently clean up the work area as they go, and get the job done on time. I thought had a major plumbing problem, but Altstadt Plumbing was able to fix the problem. The service tech, Andy Watson was very courteous and profession. He went above and beyond to make sure I was happy with the service I was getting. He was very knowledgeable and explained everything. I would definitely recommend Altstadt Plumbing! I met Andy Watson today and I could not have asked for a more professional, efficient, experienced technician to come help unstop my exterior drain. I am happy with the value of the service provided and will ask for him by name for any future work needed. Very satisfied customer!! I had a main line plumbing back up with water coming back up in to my shower. They came out and were able to identify the problem in minutes, and found a access point immediately. They were very professional and did a very thorough job. Couldn't have asked for better or faster service. If you have a back up or plumbing issue I recommend giving them a call! Very affordable pricing as well!! Great service. I called this morning to see if they could fix a busted pipe in a slab foundation. They sent two great guys about an hour after I called. It was a tricky one but they guys ended up finding the leaking pipe behind my vanity and not in the foundation. They got to work right away and fix it right up. Theses young guys were very professional and personable. I would recommend Altstadt to anyone. Their guy "Andy" did great after another company did us wrong. Not gonna lie, Im sold. Our main sewer line had a clog on a weekend. After calling several companies and being told they couldn't run our call. Alstadt answered our call and sent Floyd out within an hour. Floyd not only fixed our issue but was professional and courteous! Will definitely use Alstadt again. Thanks!! This is my first review but David and Kyle did such a great job I wanted to give them the recognition their work deserves. I came home to water all over my downstairs bathroom and in the adjoining closet. After going through all other options and realizing that the drywall was ruined anyway I cut out the area that was damaged and found the leak but was without water until it could be fixed. I called up Altstadt Plumbing and they were able to have David and Kyle come out very quickly to fix the problem. They talked me through everything and gave me a clear understanding of what they were going to do. They answered all my questions courteously and with great patience. They fixed the problem and did a great job. Thank you guys you made this whole situation much easier I appreciate it greatly. I had a water heater installed by Altstadt. Jacob was very friendly, professional and prompt. Also the lady in the office was extremely knowledgeable and friendly. I was very pleased with their work and the cost! I had received a quote from another company who wanted to charge me almost twice as much! I will definitely call Altstadt in the future. Thank you guys!! I called Alstadt on a Sat afternoon concerning a main sewer line that was blocked from my house to the city sewer. I had raw sewage backing up into my basement drain and was not able to use any water in my home at all. Bo came to my house, was there within 20 min. and had the sewer line cleared within 30 minutes. I had contacted several plumbing business's starting early in the morning and was not able to get anyone to come out on Saturday. I will use Alstadt again if and when I need a plumber. Thank You BO!!! You saved the day. Altstadt "Andy" came with a snake and I told him that's not going to work because I had another company and they had told me I was going to have serious repair to get my sink unclogged . Andy wasn't here long and he stated he was all done. I had this problem about 11/2-2weeks. Can't thank Altstadt enough!! This is the company to use!!! Both times when I called Altstadt Plumbing, they thought they couldn't get to me that same day but they DID!! 🙂 We recently had a difficult situation with needing a special type of toilet, and Tim went out of his way to find us the right product in a timely manner. He was also very caring and professional when we explained what we needed in getting the item we needed right away. Thank you! Andy helped us with a commercial issue. He was upbeat, polite and completed the challenging task quickly! 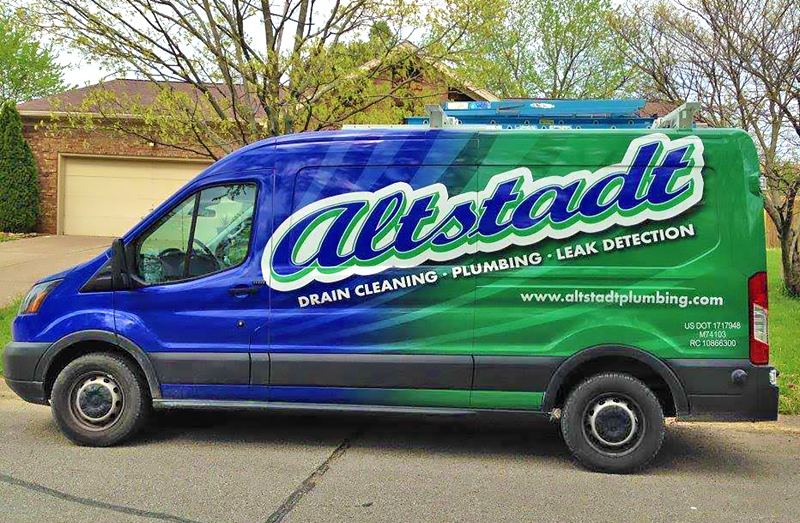 Altstadt has done two plumbing jobs for us so far, one minor and one major, and both times we were impressed with their professionalism, quality of work, and reasonable pricing. If only they did all types of home repairs so we would never have to worry whom to call when we run into electrical issues, etc!